Friday afternoon, some friends called to see what Kathy and I were doing for dinner. We said we had planned to grill a couple of steaks, but they were welcome to come join us. I said that if they wanted to bring something to throw on the grill, they could or we would have enough for them. 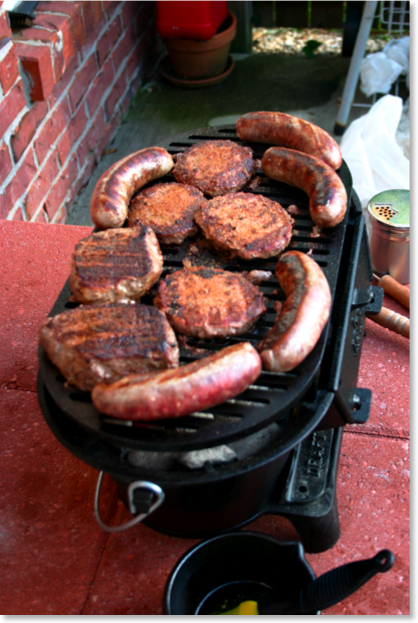 Well, they brought brats and we found a few burgers and added them to the steaks. We all shared a little bit of it all. The picture here on the left features my Lodge Sportsman's Grill . This is a great grill that is completely cast iron from top to bottom. I’ll have a full-featured review of the grill in the coming weeks. One of my initial concerns when getting this grill was whether or not it would be big enough for entertaining. However, in spite of its small size, I’ve found it to be quite adequate. I can grill up to eight hamburgers at a time and four to six steaks, depending on their size. However, in this picture, you see my new record! Here we have four hamburgers, two steaks, and five brats, all at once. 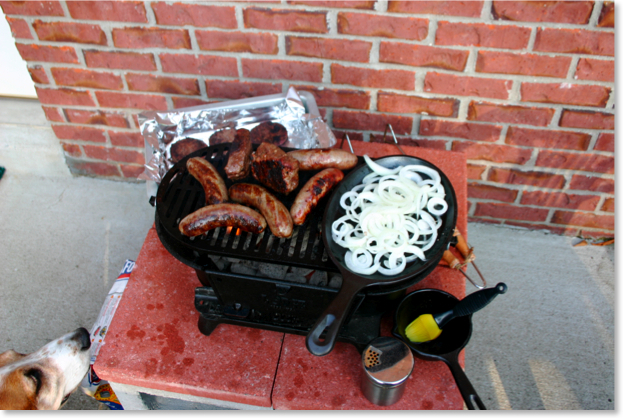 In fact, the crowded grill was quite helpful for grilling the brats on four sides. I was able to prop them up against other food cooking on the grill. Of course, I was trying to photograph the food, not my basset hound Bessie Mae. But notice her head in the bottom left corner of the picture below. There was quite a bit of canine coveting taking place on the back patio yesterday afternoon. Notice also the Lodge Sauce Kit to the right of the grill. This Sauce Kit is basically just a cast iron melting pot and a nylon brush (the bristles are actually nylon themselves and can withstand up to 400° heat). I’d been wanting one of these for a while, and Kathy and I stopped at an outlet mall earlier in the day where they had them for $14.99 ($5 off the Lodge list price). There was nothing fancy in the pot--just some olive oil that I had brushed onto the steaks to seal in their flavor before sprinkling them with a bit of my homemade cajun seasoning. When I’ve done this in the past, I always hated the fact that there’s been a little bit of olive oil left that I had to throw out because it had come into contact with raw meat. But tonight I had an idea. 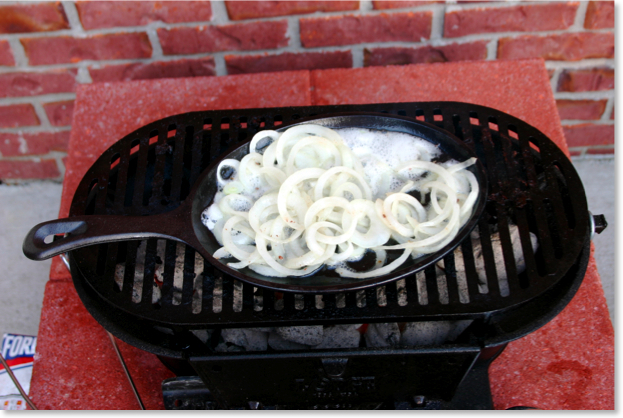 I took a chopped up vidalia onion and placed it on a cast iron fajita skillet . I poured the remaining olive oil onto the onions and cooked them alongside our grilled brats and steaks. Everyone marveled as I brought the skillet in last, sizzling restaurant style. And the grilled onions were wonderful on the brats, steaks, and hamburgers. Kathy told me she will be expecting this every time from now on when we grill.